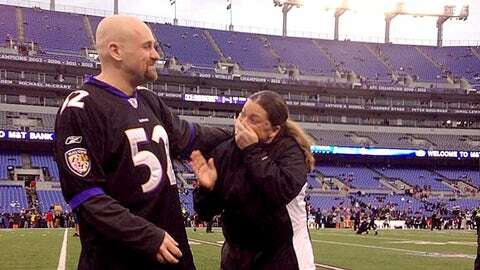 Everyone should pop the question while wearing a Ray Lewis jersey. Worst way to start a life together: This happy couple in Baltimore. I salute true love and these two Ravens fans appear to have found it as this man popped the question to his bride-to-be on the field. Let’s just hope they didn’t stick around to watch their Ravens take that 41-7 beating at the hands of the Patriots. Yuck. 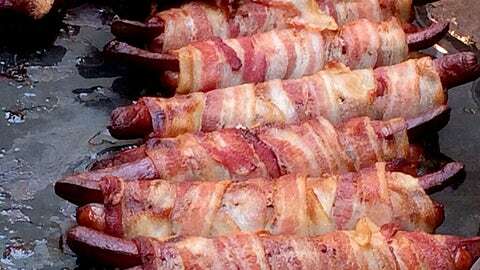 Best way to have a heart attack with a smile on your face: Folks, these are bacon-wrapped franks found at Lambeau Field. Sure, America might have an obesity problem and a high rate of heart disease. But whatever, these are awesome. Coolest display of hand signals: Philadelphia Eagles coaching staff. Check out the synchronicity by these two guys. It’s beautiful to watch. Lamest tweet after getting tossed from a game: Robert Woods, Buffalo Bills. The rookie wide receiver did a silly thing on Sunday, throwing a punch at a Dolphins player and earning an early trip to the showers. However, he made it worse by firing off this tweet that was probably best left unsaid. 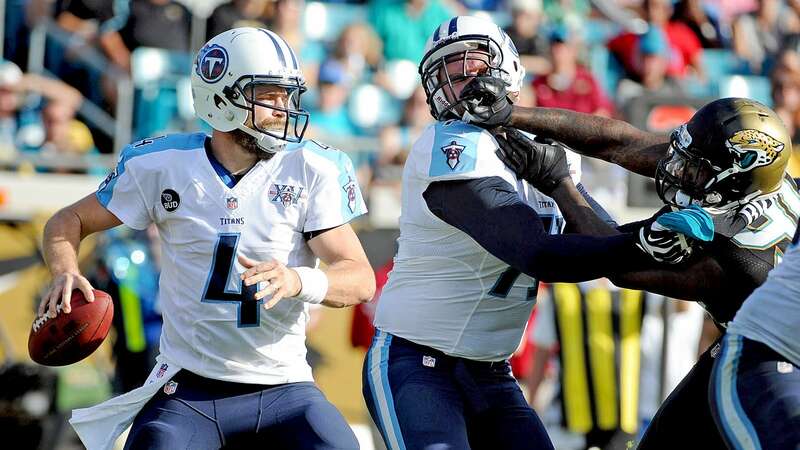 Best way to get an offensive lineman to look at his quarterback: Andre Branch, Jacksonville Jaguars. Yes, a Jaguars player made the awards this week. I had no choice after seeing Branch do evil things to Michael Roos’ face. Best postgame analysis after getting blown out: Terrell Suggs, Baltimore Ravens. T-Sizzle is always good for an epic quote and he didn’t disappoint after Sunday’s humiliation. Terrell Suggs on what went wrong: "I dont know, have to look at the tape. Actually, you could burn the tape. It's not even worth looking at"
Most dubious way to end a home-winning streak: This play that was ruled an interception and clinched the Cardinals’ win over the Seahawks. Did the ball hit the turf? Who cares, the call was made and that’s that. Best exchange between a Cardinals player and a celebrity singer: Larry Fitzgerald and Jordin Sparks. The latter is a huge Cardinals fan and was celebrating her birthday on Sunday. Well, it seems her Red Birds came through for her. 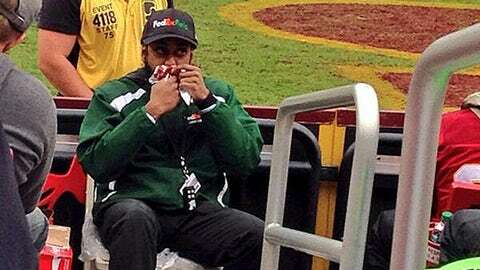 Worst job of selling hot dogs: This vendor in Washington D.C. This is a disgrace. Hey, buddy, any good drug dealer will tell you that you can’t use your own product. That kills your bottom line. Get it together. 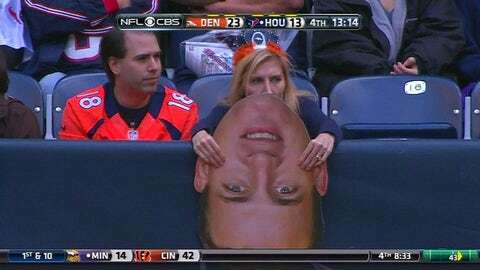 Most listless cheering of a quarterback who just set an NFL record: This lady is apparently a Broncos fan and she just watched Peyton Manning set the single-season mark for touchdown passes. Hey, can you show a little enthusiasm? Best Calvin and Hobbes reference: Doug Farrar. I don’t know if it was a horse collar or not. Actually, I don’t care. I just love Calvin and Hobbes, OK? Is that so wrong? 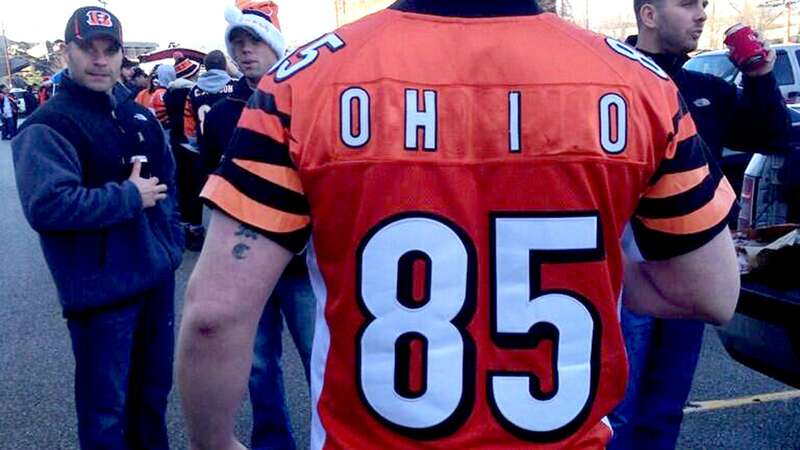 Best way to pull a MacGyver on an old jersey: This Bengals fan. As you well know, Chad "Ochocinco" Johnson isn’t in Cincinnati anymore, but that doesn’t mean that old jersey has to be thrown in the scrapheap. I admire his ingenuity. Best job of getting hit twice in rapid succession: This referee. Not only does he have the misfortune of working the Browns-Jets game (gross), the poor guy takes a shot from Antonio Cromartie. And while dealing with that pain, he gets whacked by Muhammad Wilkerson, which knocks him to the ground. Ouch. Worst job of showing respect to Ray Lewis: LeGarrette Blount, New England Patriots. Or maybe this is the best way to show respect. Either way. Best helicopter impression: Eddie Lacy, Green Bay Packers. Look at that big man fly. We have liftoff! Wheeee!